The Albany hydro plant in December 2015, when it was not working due to high water in the Calapooia River below. Albany’s small hydropower plant, restored in 2009 at a cost of about $2.2 million, was never going to justify the investment in terms of money. Now, rising costs due to more federal regulation are causing the city staff to consider shutting the operation down. The city council is getting a report on the hydropower program at its work session Monday afternoon (4 p.m. at City Hall). 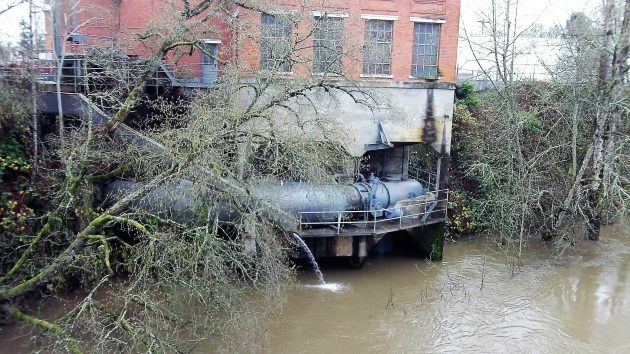 The staff is asking for the authority to study options for reducing or eliminating the regulatory burden connected with the power plant, housed in the Vine Street water treatment plant on the Calapooia River, at the end of the Albany-Santiam Canal. A related question is “whether continued operation of the hydropower project is sustainable,” wrote Mark Yeager, manager of the city’s utility services. Power from the generator, enough to supply a few hundred houses, is sold to Pacific Power. But the generator is not allowed to operate when flow in the Santiam falls below a certain level. And it can’t operate when the Calapooia is running high because that reduces the head needed to drive the turbine. As a result, the plant has produced power only 68 percent of the time over the last fine years, according to Yeager’s report. Revenue from the plant has averaged $84,000 a year over five years. Yeager said the highest annual amount was $141,000 and the lowest $50,100. But in November 2015, another city official told me that in fiscal 2015, revenue from Pacific was only $41,312.36. Direct annual costs of operating the system, including canal maintenance, to meet federal regulatory requirements have averaged $104,000 a year over three years, according to the memo. Staff time devoted to working with the Federal Energy Regulatory Commission, such as making reports, preparing plans and arranging for safety inspections of the dam, was estimated to cost an additional $135,000. The standards applied to the Albany system are the same as for huge dams and not affordable for a comparatively small operation. “Albany needs to explore options for reducing or eliminating the hydropower project-related regulatory obligations,” the memo says.